Challenge: How can we modify to meet the individual needs of patients? 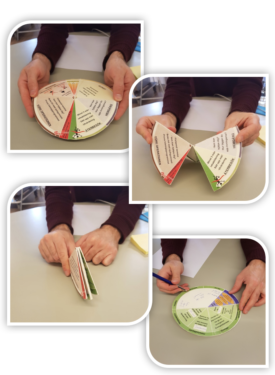 The final prototype of the “Process Wheel” concretizes the initial thoughts that were elaborated in cooperation with the Unit 35E staff members. The overall goal was to construct a communication tool for the staff and patients before their surgery or at the registration day at SöS, in order to facilitate the patients with a simplified overview of the surgery process and also increasing patients self-awareness and their responsibility in the process. 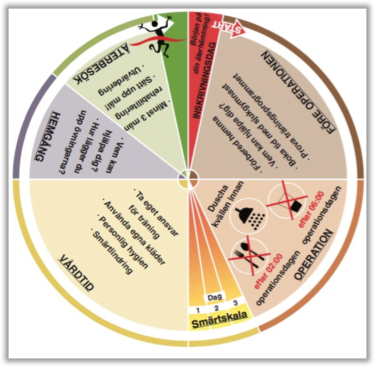 Therefore, the Process Wheel provides visualization of and recommendations for the whole surgical process a patient has to be aware of. The core idea was to evolve or invent a communicative tool that encouraged the patient’s engagement and commitment during the surgical process in order to help the patient’s self-efficacy. The Wheel concretizes that by providing patients the necessary information and giving the patients a sense of control over their recovery. Furthermore, the patient’s individual value and needs were of key importance to the Process Wheel, therefore the wheel was constructed in a way that it takes the patient’s individuality into account while also being generally implementable. Feedback from prototype testing on the patients were in general positive. The patients were inclined to use the Process Wheel and they could recommend its application beyond Unit 35E into the health-care system in general. The potential for future digitalisation of the Wheel is something to be considered.